So I cleaned my bearings at the end of the season and finally tested acetone in the BSB cleaning bottles. Which happily did not melt, and my bearings came out cleaner and spinnier than out of any other process I have used: citrus cleaner in Bones bearings washer, acetone in old mayo jar, and citrus cleaner in BSB cleaning bottle. The BSB cleaning bottle is nicely designed so that the cleaner swooshes through the bearings and all the scuzz settles to the bottom. Acetone really loosens the scuzz to get it out, and then the acetone evaporates almost instantly when you take the bearings out of their bath. 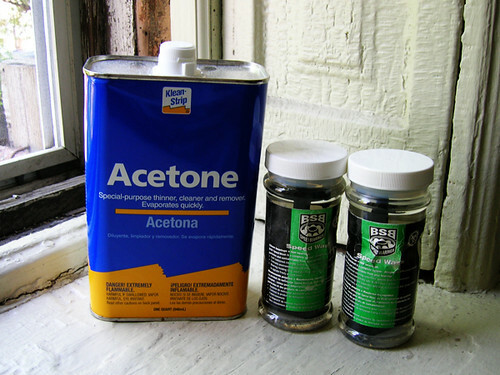 You may want to wrap the bottle in a rag so the acetone doesn't get too much on your hands when you're shaking it up, and always remember that acetone should be used in a well-ventilated space.